OVER SIX THOUSAND QUALITY, UBER RARE AND ORIGINAL ITEMS AMASSED OVER THE LAST FORTY YEARS. YOU WILL NOT BELIEVE SOME OF THE ITEMS THAT WILL BE LISTED IN OUR STORE OVER THE COMING MONTHS. THIS COLLECTION SHOULD GENERATE MASSIVE INTEREST WITHIN THE ELVIS WORLD. THERE WILL BE NO EXCEPTIONS. ITEMS WILL ALSO BE SENT OUT IN OUR USUAL"BOMB PROOF" PACKAGING. 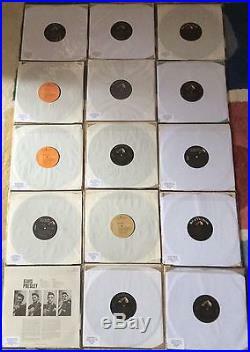 THIS IS AN AMAZING LISTING-EVERY SINGLE VARIATION OF THE ICONIC NUMBER ONE ALBUM FROM THE VERY RARE FIRST PRESS TO THE LAST PRESS UP UNTIL ELVIS'S DEATH IN 1977. A TRULY REMARKABLE ACHIEVEMENT TO HAVE HAD THE TENACITY TO COLLECT ALL FIFTEEN VARIATIONS. I WILL LIST EVERYTHING AS BEST AS I CAN IF YOU NEED ANY FURTHER INFORMATION ON INDIVIDUAL RECORDS PLEASE LET ME KNOW. VINYL AND LABELS ARE GRADED FIRST AND COVERS SECOND. 1/ VERY VERY FIRST PRESS FROM MARCH 1956- VG/VG. 2/ 1956 PRESS WITH LIGHTER PINK LETTERING TO THE COVER- MINT MINUS/VG++. 3/ 1956 PRESS WITH DARKER PINK LETTERING TO THE COVER-MINT MINUS/MINT MINUS. 4/ REISSUE DEC 1961-BLACK LABEL STEREO WITH MEGA RARE NO "e"-MINT MINUS/MINT MINUS. 5/ REISSUE DEC 1961-BLACK STEREO LABEL-LSP1254e-MINT MINUS/MINT MINUS. 6/ REISSUE DEC 1961-LPM 1254-MINT MINUS/MINT MINUS. 7/ REISSUE NOV 1963-MONO BLACK LABEL-MINT MINUS/MINT MINUS. 8/ REISSUE OCT 1964-MONAURAL- MINT MINUS/VG++. 9/ REISSUE OCT 1964-STEREO- MINT MINUS/MINT MINUS. 10/ REISSUE NOV 1968 ORANGE LABEL RIGID VINYL-MINT MINUS/VG+. 11/ REISSUE 1971 ORANGE LABEL ON FLEXIBLE VINYL-MINT MINUS/ MINT MINUS. 12/ REISUE 1976 TAN LABEL REISSUE MINT MINUS/VG+. 13/ REISSUE 1977 AFL1-1254e NEW BLACK LABEL-MINT MINUS/MINT MINUS. 14/ REISSUE 1977 LSP-1254e NEW BLACK LABEL-MINT MINUS/MINT MINUS. 15/ REISSUE 1977 AFL1-1254e NEW BLACK LABEL WITH DIFFERENT COLOURED LETTERING TO THE FRONT-STILL SEALED WITH CUT OUT BOTTOM. 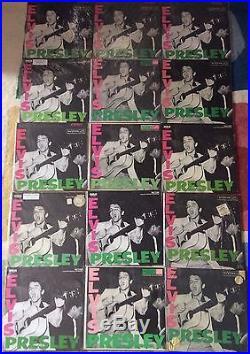 The item "ELVIS PRESLEY- AMAZING-ALL 15 USA VERSIONS OF THE NO1 ALBUM FROM 1956-1977" is in sale since Sunday, July 30, 2017. This item is in the category "Music\Records\Albums/ LPs\Rock\Elvis".